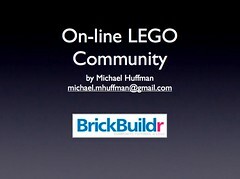 If you want to download/view a copy of the presentation I gave at Brickworld, you can find it here. When I came up with the idea to talk about the On-Line LEGO Community, I meant for it to be a round table discussion... it didn't work out that way. So at the last minute, I threw together a slide presentation on my Mac. I meant for it to be an introduction to the on-line community to newbies; to (1) introduce them to some web-sites they may have never heard of before; (2) give them some tools for keeping up with the on-line community; (3) expose them to the diverse nature we call the LEGO community. But at the same time, for those of us who have been in the community for awhile, I wanted to (1) address some of the problems we're having as a fragmented community; (2) look at emerging technologies that might help overcome fragmentation; (3) think about the future and how to "play well" together; (4) steps in preserving our on-line past; and (5) ask ourselves how much involvement should TLG play in the development/preservation of the fan of LEGO community. Needless to say, there's a lot of topics to cover & I didn't cover them nearly as deeply as I would have liked. And after about 45 minutes of standing in-front of people, talking, I needed a drink & started loosing steam. At first, I just had a rough outline and really didn't think I had much to say, but the more I thought about the LEGO community, certain ideas started to emerge. And I also thought that I wasn't best qualified person to do it, but to be honest, I've been fascinated with the LEGO fan community for some time now -- the creativity, the personalities, the drama, and the fragmentation. Anyway, as I think more on the subject, I'll update the presentation, hopefully with more details. I've already have a few more ideas that I want to add to it, but still trying to figure out where/when in the presentation they should go. Oh, by the way, I'll post my thoughts on Brickworld in the next day or so... been meaning to do that as well. Update: Just added more slides with more details... It's staring to shape up into a nice document.